weak signal that is present at the antenna to be amplified to a viewable strength. Also, known as a preamp, antenna booster, mast amplifier. A preamplifier such as the Channel Master 7777 can instantly improve TV reception. The Channel Master television antenna booster (preamplifier) will amplify digital and HD signals received by your antenna. This antenna preamplifier is a high gain, low noise preamplifier used for weak signal areas to allow a weak signal that is present at the antenna to be amplified to a viewable strength. This TV antenna preamplifier works best for persons in weak signal areas and is subject to overdrive if used in areas with fairly strong signals. In stronger signal use the Winegard LNA 200 preamplifier. Preamplifiers are also used if you anticipate distributing your signal with a signal splitter to multiple outlets throughout your house as splitters reduce the signal strength available at each output. Channel Master 7777 preamplifier specifications. • Preamplifier and its power supply can withstand up to 140° F operating temperatures. Antenna Booster for TV The most important element of a TV antenna system is the antenna and a close second is the signal distribution system including signal boosters. Denny - Your TV antenna mast mount pre-amplifiers --- How the 7777 preamplifier powered ? --- I don't see any easy way to get 120VAC up to an antenna if they are AC powered. 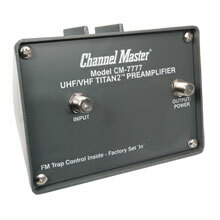 Have a question about the Channel Master 7777 TV antenna preamplifiers?? ?